Boneyard Keepers are towering servants of the Ideal Masters who reside in the Soul Cairn. Charged with the incarceration of Valerica, they herd imprisoned souls and drain their energy to maintain the barrier in front of the Boneyard. Three appear during Beyond Death and do not respawn. 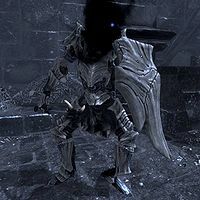 They all wear dragonplate armor, boots, and gauntlets, and drop black soul gems filled with grand souls. The first (ID:xx007B0F) carries a dragonplate shield at all levels, and wields a leveled dragonbone mace (standard at level 10, enchanted with 15-30pts frost damage depending on level and slow at all levels above 10). The second (ID:xx0074F8) wields a leveled dragonbone battleaxe (standard at level 10, enchanted with 15-30pts frost damage depending on level and slow at all levels above 10). 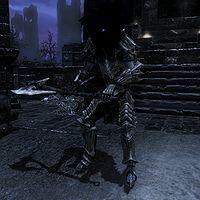 The third (ID:xx0074F9) carries ten dragonbone arrows at all levels, and wields a leveled dragonbone bow (standard at level 10, enchanted with 10-30pts frost damage depending on level and slow at all levels above 10). 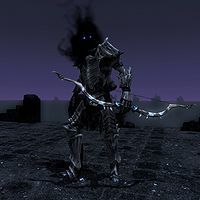 At level 45 and higher, the first will drop a dragonbone mace, the second will drop a dragonbone battleaxe, and the third will drop a dragonbone bow along with ten dragonbone arrows (all unenchanted versions). Beyond Death: Search for Valerica in the Soul Cairn.